As floodwaters finally subside in Houston, and as Florida residents prepare for Irma, residents, civic leaders, and policymakers can glean two important lessons from the intensive efforts to rebuild homes and communities after Hurricanes Katrina and Rita, two devastating storms that hit the U.S. in back-to-back succession in 2005. First, rebuilding residential properties is a lengthy process likely to take several years. Second, the rebuilding process will be especially lengthy for rental properties (as compared to owner-occupied homes), which could greatly affect the 950,000 renters (who account for 41 percent of households) in the greater Houston metropolitan area, as well as additional renters affected by Hurricane Harvey in elsewhere in Texas and in other states. The slower pace of rental rebuilding is due to several factors including both renters’ dependence on property owners to rebuild rental housing units and historical differences in the availability and terms of federal aid for rental property owners as compared to homeowners. To be sure, the need for emergency assistance and shelter for displaced residents will continue for weeks to come. Nevertheless, Congress is already starting to discuss an aid package. 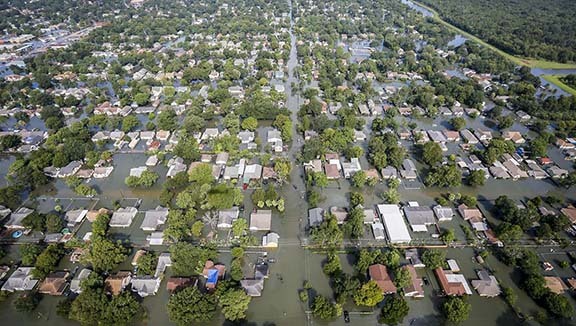 Moreover, the extensive damage (and the need to reauthorize the National Flood Insurance Program before September 30) may spur new efforts to develop policies and programs to support housing recovery in the wake of future natural disasters. As policymakers, civic leaders, and local residents begin to focus on the rebuilding process, they might want to keep the following in mind. 1. Rebuilding residential properties takes time. An initial lesson from Hurricanes Katrina and Rita is that the rebuilding process takes time, with many properties continuing to show observable damage several years after the storms had passed. In early 2010—almost five years after both hurricanes made landfall—a HUD-commissioned study that I worked on surveyed the exterior conditions of properties damaged by those storms. The survey produced representative estimates of the rebuilding outcomes of properties that experienced “major” or “severe” damage—defined by FEMA as $5,200 or more in storm-related damage—that were located on significantly-affected blocks—defined as a city block on which three or more properties experienced “major” or “severe” damage. 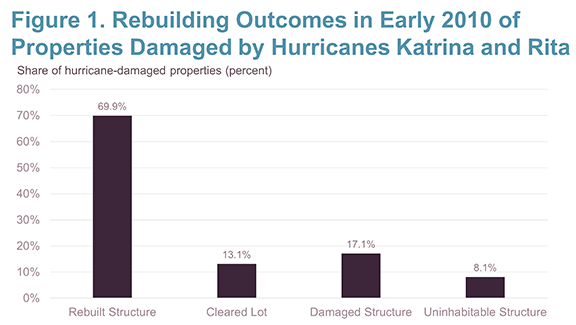 The survey found that 17 percent of hurricane-damaged properties in Louisiana and Mississippi still showed substantial repair needs as of early 2010, almost five years after the storms had hit. Almost half these properties did not meet the U.S. Census Bureau’s definition of a “habitable structure,” a housing unit that is closed to the elements with an intact roof, windows, and doors and does not show any positive evidence (e.g. a sign on the house) stating that the unit was condemned or was going to be demolished. 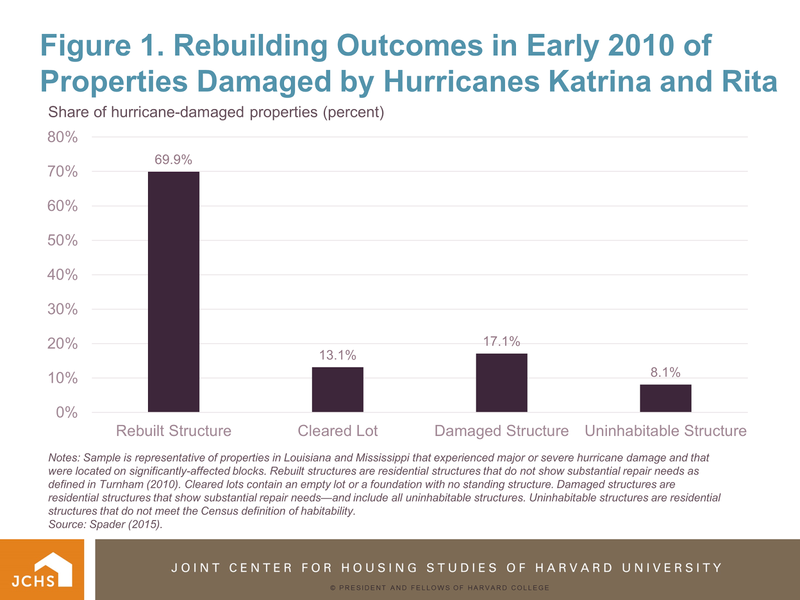 Only 70 percent of hurricane-damaged properties in Louisiana and Mississippi were rebuilt by early 2010, and 13 percent contained cleared lots in which the damaged property had been removed from the parcel (Figure 1). In the case of Hurricanes Katrina and Rita, the properties that still were damaged included some whose owners had received rebuilding grants through federal programs designed to aid housing recovery. The largest source of assistance following the 2005 hurricanes was the $18.9 billion special Community Development Block Grant (CDBG) appropriations passed by Congress between 2005 and 2008. Some portion of the properties with remaining damage likely also reflect abandonment by owners who moved elsewhere in the wake of the hurricanes. For such properties, funding for demolition, rehabilitation, and land banking may be necessary to transition the properties to a new use, and potentially to support efforts to encourage residents to rebuild in areas with lower flood risks. Notes: Sample is representative of properties in Louisiana and Mississippi that experienced major or severe hurricane damage and that were located on significantly-affected blocks. Rebuilt structures are residential structures that do not show substantial repair needs as defined in Turnham (2010). Cleared lots contain an empty lot or a foundation with no standing structure. Damaged structures are residential structures that show substantial repair needs—and include all uninhabitable structures. Uninhabitable structures are residential structures that do not meet the Census definition of habitability. 2. Rental properties were rebuilt more slowly than homeowner properties. A second lesson from the rebuilding process following Hurricanes Katrina and Rita is that rental properties were rebuilt more slowly than owner-occupied homes. This likely was due to several factors. While homeowners directly control the rebuilding progress of their home, renters are dependent on landlords’ rebuilding decisions. Smaller “mom-and-pop” landlords may also be slower to rebuild investment properties if their own home is also damaged. And policymakers have been wary of providing rebuilding assistance to rental property owners who did not purchase sufficient insurance. Following Hurricanes Katrina and Rita, both Louisiana and Mississippi used the CDBG special appropriations for disaster recovery to create rebuilding assistance programs for homeowners and small rental property owners. (Texas, which faced less damage from Hurricanes Katrina and Rita, created only a homeowner program.) In both Louisiana and Mississippi, the homeowner programs covered much of the difference between the estimated cost to rebuild and the amount available to the homeowner from insurance and other rebuilding-assistance programs. Conversely, the grant programs for 1-4 unit small rental properties included a more complex set of eligibility requirements that included commitments for the rebuilt units to be rented to qualifying low- and moderate-income tenants. 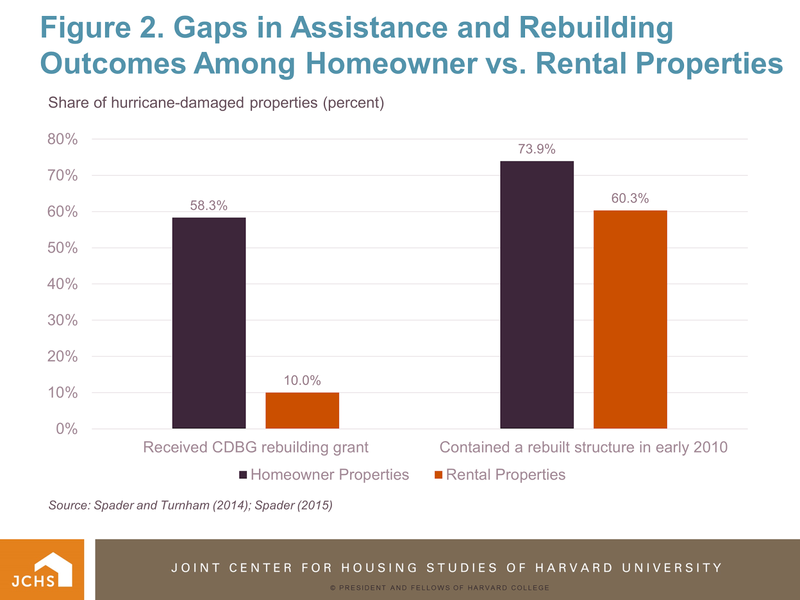 The result was that few rental property owners applied for and received rebuilding assistance, compared to widespread take-up of the homeowner assistance programs. While concerns about the incentive effects associated with bailing out under-insured investors are reasonable, a secondary effect was to reduce the number of rebuilt properties available to renters. Figure 2 displays the share of hurricane-damaged properties on significantly-affected blocks that received a rebuilding grant through the CDBG-funded homeowner and small rental programs, along with the share of homeowner and small rental properties that were rebuilt by early 2010. The results show that 58 percent of hurricane-damaged homeowner properties in Louisiana and Mississippi received a rebuilding grant, compared to 10 percent of small rental properties. 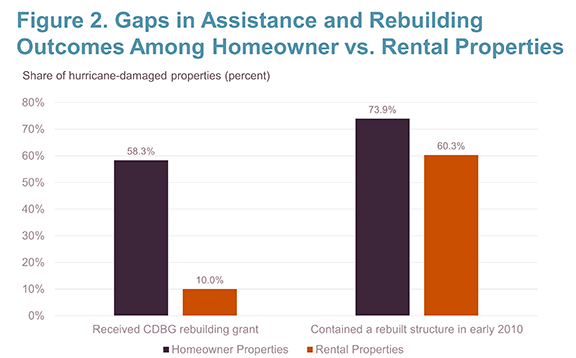 While this rental figure is limited to 1-4 unit small rental properties, a GAO report similarly found that federal assistance through CDBG, the Individual and Households Program, and the Home Disaster Loan Program together reached only 18 percent of all damaged rental units (including units in larger multi-family buildings), compared to 62 percent of damaged homeowner units. The rebuilding outcomes documented in the HUD-commissioned survey also showed sizable gaps, with 74 percent of homeowner properties rebuilt by early 2010 compared to 60 percent of rental properties. A final question for policymakers is whether to use this opportunity to create a permanent program to support housing recovery following natural disasters. While Congress has relied on the CDBG program for this purpose since the early 1990s, its role is currently defined by the special appropriations legislation drafted following each individual disaster. Making disaster recovery a permanent function of the CDBG program (or creating some other permanent program for housing recovery) would allow HUD to develop permanent regulations and program guidance in anticipation of future disasters. While it is too late for this change to benefit victims of Hurricane Harvey, it might improve preparedness for the next disaster.